WinStar Farm, China Horse Club International and Starlight Racing’s Improbable was installed the 8-5 morning-line favorite for Saturday’s $1 million Arkansas Derby (G1) at Oaklawn Park. The Bob Baffert-trained son of City Zip, who bears a striking physical resemblance to last year’s Triple Crown champion Justify, picks up a new jockey in Eclipse Award winner Jose Ortiz and the pair will break from the innermost post position. Improbable is Baffert’s seventh morning-line favorite in the Arkansas Derby in the last nine years. 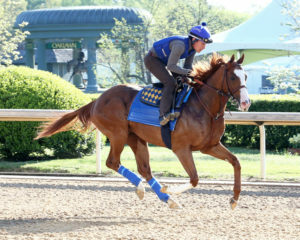 He famously used the Arkansas Derby route to the Kentucky Derby with Triple Crown hero American Pharoah in 2015 and also saddled 2012 winner Bodemeister. The flashy chestnut won his first three career starts, including the Los Alamitos Cash Call Futurity (GI) in December before losing by a neck to Long Range Toddy in his sophomore debut, the first division of the $750,000 Rebel Stakes (GII) March 16. So far Improbable has earned 25 Road to the Derby points and sits 26th, so its likely a top two finish is necessary, based on points awarded (100-40-20-10), to make the starting gate for the Kentucky Derby in three weeks. 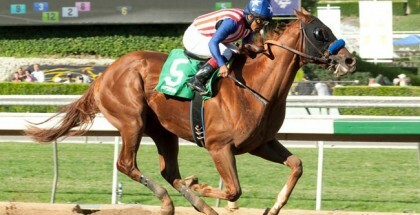 Fellow California invader Omaha Beach, who won the second division of The Rebel Stakes over champion Game Winner in his last start, which was his first in stakes company, will break from post three on Saturday under Hall of Fame jockey Mike Smith and has been labeled the morning line’s second choice at 2-1. Willis Horton’s Long Range Toddy, who already is guaranteed a spot in the Derby gate with his current points total of 53.5 points, is the 5-1 third choice on the morning line for the Arkansas Derby. 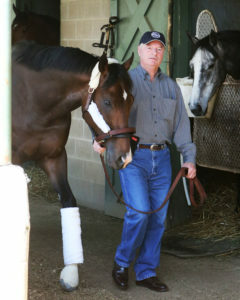 The son of Take Charge Indy, who is trained by Steve Asmussen, will carry veteran Jon Court once again. “The Arkansas Derby and the Kentucky Derby are the two I’m living for,” 79-year-old Horton, an Arkansas native who turns 79 on April 17, said. The entire Arkansas Derby field, from the rail out with riders and morning line odds, is Improbable, Jose Ortiz, 8-5; Six Shooter, David Cohen, 30-1; Omaha Beach, Mike Smith, 2-1; Tikhvin Flew, Tyler Baze, 30-1; Laughing Fox, Ricardo Santana Jr., 20-1; Gray Attempt, Stewart Elliott, 8-1; Galilean, Flavien Prat, 10-1; Country House, Joel Rosario, 12-1; One Flew South, Calvin Borel, 50-1; Jersey Agenda, Ramon Vazquez, 30-1; and Long Range Toddy, Jon Court, 5-1. 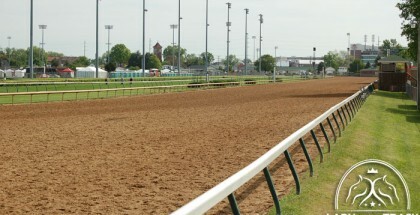 Post time for the Arkansas Derby, which goes as the 11th of 12 races, is set for 6:41 p.m. CT.